Quick summary: In this lesson, students will learn about the paper recycling loop and the impact that choosing recycled products can have. Students will complete a persuasive writing task based on factual stimulus material. It focuses specifically on persuasive writing structure while also providing the opportunity to practise broader writing skills. This lesson is designed to provide valuable practise for NAPLAN, the national literacy and numeracy test held in Years 3, 5, 7 and 9*. This lesson has been developed as part of Planet Ark’s National Recycling Week, which aims to raise awareness around the benefits of using recycled products, including paper. 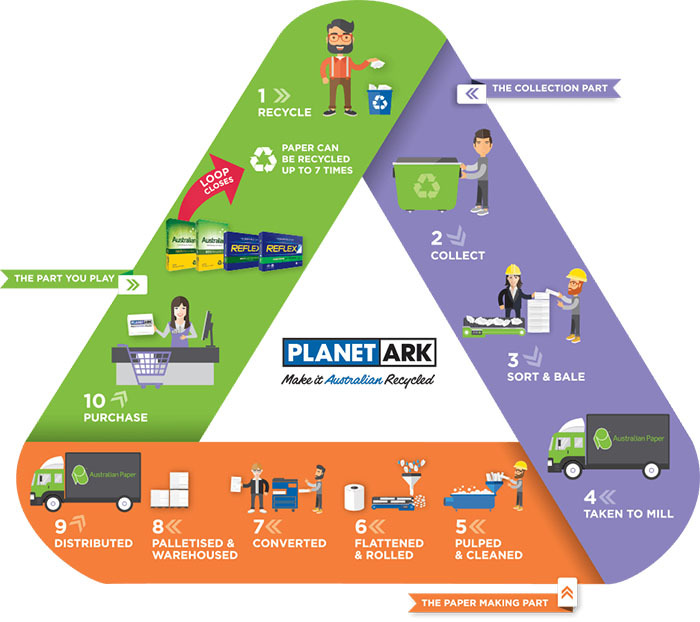 Take part in the Schools Recycling Right Challenge for Planet Ark’s National Recycling Week. Register your lesson or other activities today! Students understand how and why to close the paper recycling loop. Students use suitable structure to create an effective persuasive writing piece. Relevant parts of Year 3 achievement standards: Students understand how language features are used to link and sequence ideas. They understand how language can be used to express feelings and opinions on topics. Their texts include writing and images to express and develop, in some detail, experiences, events, information, ideas and characters. Students create a range of texts for familiar and unfamiliar audiences. They demonstrate understanding of grammar and choose vocabulary and punctuation appropriate to the purpose and context of their writing. Relevant parts of Year 4 achievement standards: Students use language features to create coherence and add detail to their texts. Students create structured texts to explain ideas for different audiences. They make presentations and contribute actively to class and group discussions, varying language according to context. Level of teacher scaffolding: Medium – students who have difficulty with writing tasks set for Year 3 and 4 standard will require support for this task. Resources required: Student worksheets – one per student (printed). Projector with sound to view video. If possible, use recycled paper to print worksheets on and save any discarded paper to re-use in other classroom activities. Keywords: Planet Ark, recycling, recycling loop, persuasive, text structure, paragraphs, opinion. Students write persuasive texts following a suitable structure. ... explain what it means to close the recycling loop. ... explain why closing the recycling loop is important. ... organise their persuasive texts into paragraphs. ... write a persuasive text that includes a statement of opinion, at least three supporting arguments and a closing statement. Teacher content information: This lesson has been developed as part of Planet Ark’s National Recycling Week, which aims to raise awareness around the benefits of using recycled products, including paper. By recycling paper, we are all helping reduce the amount of waste going to landfill. Thought Starter: We can all close the recycling loop. How does purchasing recycled toilet paper help to close the recycling loop? What would the impact be if no one purchased recycled paper products? What would the impact be if we all purchased recycled paper products? Statement of Opinion/Viewpoint This paragraph should explain your point of view to the audience in a powerful way. (each argument in its own paragraph) This part of the text requires you to explain each argument in its own paragraph.